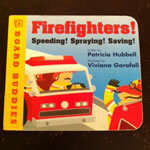 KID BOOK RATINGS: Firefighters! Speeding! Spraying! Saving! Craving a thrill? We've got so much action for you here, it's gonna require a second exclamation point!! A very enjoyable book from the 'Board Buddies' collection. Patricia Hubbell and Viviana Garofoli produced a powerful partnership. What's interesting to me is that in a previous review, I took a separate author to task while having completely neutral feelings on the illustrator (Garofoli). I guess it just goes to show that publishers should think long and hard about who they pair up on projects if they want to turn out consistently solid work. They can't all be home runs, but there's nothing wrong with being a high-average singles hitter like Ichiro, is there? I guess we are best friend now? YAY! !